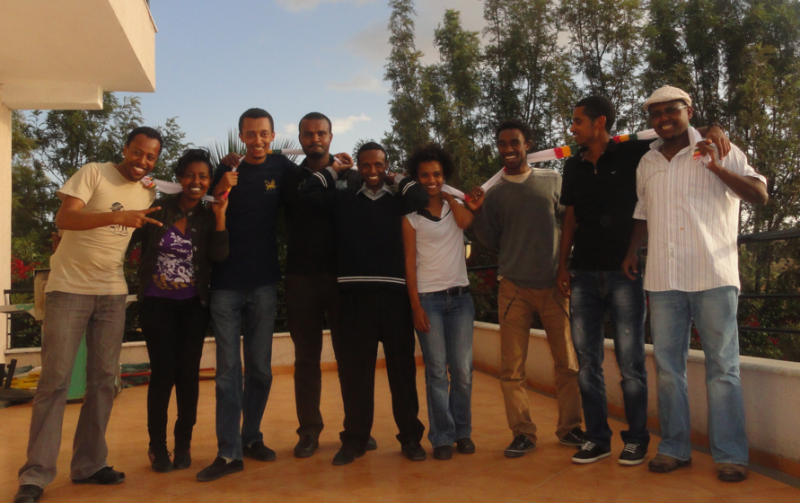 Zone9 bloggers together in Addis Ababa, 2012. Photo courtesy of Endalk Chala. Ethiopia's Zone9 Bloggers were acquitted by an Addis Ababa court on Friday, October 16 after spending 18 months in prison, mostly awaiting trial on baseless charges of terrorism and inciting violence. They have yet to walk free from Kilinto prison, but their families say they will be released by Monday, October 19, if not sooner. The four bloggers had all contributed to Zone9, a collective blog that covered social and political issues in Ethiopia and promoted human rights and government accountability. One member of the group, Befeqadu Hailu—also a Global Voices author—has not been cleared of a remaining charge under Article 257 of the Ethiopian criminal code, but reportedly it is a minor charge, for which the maximum penalty is six months’ imprisonment. As Befeqadu has been in prison since April 25, 2014, sources close to him assume that the penalty will be moot. Six members of the Zone9 collective, along with three journalist contacts, were arrested and taken from their homes on April 25 and 26, 2014, and detained for 11 weeks before authorities charged them under Ethiopia's infamous Anti-Terrorism Proclamation, which has been used to imprison several prominent journalists and bloggers who have written critically about the government and ruling party. Five members of the original group were absolved of all charges and released on July 8, 2015. The fate of the remaining four—Befeqadu, Natnael, Atnaf and Abel— remained unknown until today, October 16. During the course of their imprisonment, the bloggers appeared before a judge 39 times, only to be turned away by prosecutors’ requests for “more time” to investigate the case. The question of what will happen to other citizens imprisoned for writing or speaking critically about the government—such as Zelalem Workagenegu, a blogger who was jailed after applying to participate in a social media and digital tools training—seems more pressing than ever. As many supporters pointed out, the acquittal may not mean that Ethiopia plans to change its ways.